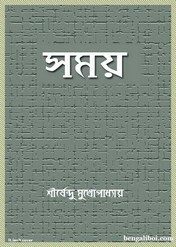 'Samay' is a popular book by Shirshendu Mukhopadhyay who is a famous Bengali author in modern Bengali literature. The book- Samay, there are eleven short stories in this book, these are- 'Bhagabaner Abirbhab', 'Rambabu Ebong Kanai Kundu', 'Bhuter Bhabishyat', 'Bhusuk Pandit', 'Rumal', 'Joyrambabu', 'Bazardar', 'Buddhiram', 'Chalchitra', 'Chharpatra' and 'Samoy'. Readers can collect all these amazing short stories in a cover. This author lived a simple life. From the dream he has been collecting diversified story and their various characters for his story-novels. Collect the Bangla Galper Boi as pdf download- 'Samay- Shirshendu Mukhopadhyay'.